Running can be hard! It doesn't matter what pace you normally run at, whether you are fast, slower, or somewhere in between, we ALL struggle from time to time. 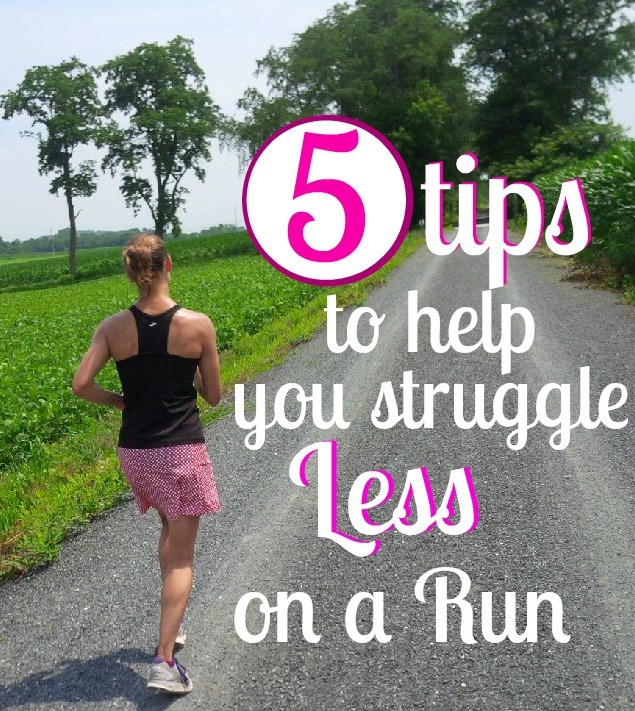 What do you do when you start to struggle on your run, but quitting is NOT an option (because how else will you get home or back to your car)? Of course I guess we could walk the rest of the way (and I'm sure we've all done that at least once, right?). The goal of course is to just keep moving. Here are a few tricks both of us have used from time to time to help us speed up and get that run finished. 1. Think of a reward: Whether it be a cold Starbucks Frappe or a glass of wine, think "Well, if I can go this far, I will reward myself with (insert treat here). And if not, than I guess I didn't want it that bad". 2. When my legs are starting to slow down, I put more effort into using my arms. It's amazing how your pace can pick up once you get those arms moving. 3. Another thing I do when I start to slow down is that I concentrate more on form. My PT once told me that in true running form your feet should feel like they are pushing off from a skateboard. Once I start concentrating on this, things get easier. Also (I have not official been told to do this by a coach or PT), but sometimes I sway my hips back and forth when I run because that makes it easier as well. I figure if it make race walkers faster, then it should make me run a little faster too and sometimes it does. 4. Hearing a good song on our playlist always gives us that pep in our step. It might be just that one song that helps you get to the finish line feeling a little stronger. What is that song for you? 5. Finally, one other thing that helps me get through a tough run is when I completely zone out and stop thinking of the run. When I start thinking about something else (like my next blog post), it seems like I start running a little better and the miles start going quicker. I like your form tips! I also try to focus on form when I get tired but its helpful to think of something specific to work on. I've never heard of that skateboard one before! Yea, I never heard of it either before the PT told me. It sounds corny, but I always think about how badly I'll feel if I quit! Or how long it will take me to get home. That's usually enough to push me home. Miles do seem to go by faster when you are with a friend! When I struggle I go back to yoga breathing, correct my form (stop slouching, lift my diaphragm) and let the tension run down my back. And yes, arms can help a ton! That's interesting about the hip swaying. I'll do that sometimes during my walk breaks but have never tried it while running. And the skateboard is a great visual! I will sometimes try to focus on nature when I'm struggling -- sometimes it helps; sometimes it doesn't. Sometimes I'll do a body check & make sure everything is feeling ok. The hip sway thing is actually a tip used in race walking! I figured if it helps in walking that I should try it in running. Now some may argue that that may cause problems but I don't do it that often and when I do it actually does help! I like to take a deep breath and let me mind to start wandering! and not wondering if I am ever going to be done! TGIF! A starbucks frap is always motivation for me!!!! Great tips! Have a wonderful weekend. these are great tips! I often use #5 to get through a hard run. When I zone out and just focus on the music, it makes the run go by much quicker! I'm all about rewarding myself so I love that tip. Love these! Along with focusing on pumping my arms I also like to think about pulling my knees up during a run if I'm struggling. This seems to help me push off the ground stronger when my form starts to suffer. I've definitely used the thinking of a treat or concentrating on my form things. I've never really thought about using my arms more. I'll have to keep that one in mind. I use mantras and try to think positively. I also use #5 and count 100 steps on each leg to get my mind off of whatever is bothering me. ;) Also, a good podcast or audio book helps me. I love getting a very targe frapp after a long run! And I've also draft my post while on long runs, when the running gets long, the mind has to focus on something else. Music definitely helps me when I'm struggling to stay motivated. Its amazing how having an upbeat song come on can help put some pep back in my step. I try to keep the arms thing in mind. I remember watching Spirit of the Marathon and Deena Kastor talked about how important upper body training was. I do the reward thing when a long run gets particularly hard - it helps, it really does! I like your idea about concentrating on form, too - anything for a distraction, right? Music is the one that is key for me. I have some go-to songs that just pump me up. As soon as I stop thinking about running it becomes exponentially easier! When I start t struggle, I try to focus on the mile I'm in rather than how many more I have to go. If I am struggling, I try to focus and enjoy my podcast! Zoning out helps me, for sure! Have a great weekend, gals! When my legs start slowing down, I try to run while moving my legs higher. It does help a lot. Usually when I struggle I tell myself "just run for 30 seconds or 1 minute. You can do anything for 30-60 seconds." Or I'll tell myself to get to the next mile then take a break. When I get to the next mile, I trick myself by telling myself to just go one more mile. It's worked before for me. Ooh, using your arms when your legs are tired is so good! I use mine more when I go uphill and it really helps! Sometimes I focus on my breathing to get me through a tough part of a run. Trying to follow a breathing pattern really helps. I always look at it when I'm struggling - especially during sprint intervals - that at least I can move my legs when so many others can't. Helps keep things in perspective.